Microsoft had a great year in 2016. More information on Project Scorpio was released, the Xbox One S was sent out, and great deals were to be had as well as numerous releases. Sales for their console were up compared to Sony, and overall sales were great for the company. So with 2017 coming around the corner – can Microsoft still do well without any news of releases for their flagship titles and series? In 2016 we saw releases for the new Forza games and the 4th game in the Gears of War series. Halo 5 was released last year. So what do we have to look forward to in 2017? All 3 of these franchises are big earners, and generate a lot of fan fever – but isn’t it nice to take a break? There are many games featured to come out next year, many new IPs, a few sequels – but are they the caliber of the AAA titles? That coupled with Project Scorpio launching, I think Microsoft will do ok without a new game from the big 3. Even better would be an announcement at next year’s E3 for an upcoming sequel or new game. Traditionally we see a 1-2 year gap between sequels, so at best we could expect Halo 6. They did state Halo Wars 2 will be released Q1 – so that will hold fans over. Microsoft unfortunately has a giant to go up against with Sony. Sony’s list of releases next year rival past years. Traditionally it seems that Sony goes full on ahead the first 2 quarters of the year, and seems to slide into second the last 2. That might be the trend for 2017 as well. However, without a blockbuster release from Microsoft, Sony might be able to capitalize and take the entire year with exclusives. Without firm release dates as of yet, we could possibly have many blockbuster titles release next year, including The Last of Us Part II, the new God of War, Spiderman, Death Stranding, Days Gone, the next Ace Combat – the list goes on. 2017 might even show the much awaited Final Fantasy VII remake. With most of those games TBA – they could become peppered throughout the year, and not focused on Quarters 1 and 2. The list of Microsoft games in 2017 for exclusives seems to be filled with secondary titles, like the next Crackdown – but mostly Indie games. That means Microsoft will have to stand on the profits from multi-platform releases like Mass Effect Andromeda, RE7, Prey, Red Dead Redemption 2 and For Honor. The deal could be sweetened with exclusive DLC or new maps, skins the usual to entire folks to buy Xbox instead of Playstation, but that only goes so far. Giving fans an extensive list of games, over multiple genres is the way to make gamers happy and increase profit margins. What are your thoughts and predictions for 2017 – Do you think Microsoft can stand a chance and show an increase in sales over this year? What games are you looking forward to next year? Make your comments below. And as always follow ThisGenGaming on Twitter @TGGamingReviews for all the news, reviews and commentaries in the gaming industry. Forza Motorsport 7 will be out end of this year. When Scorpio comes it will have thousands of games from the Xbox 360, multiplats, exclusives and indies due to full backward compatibility — no technical wizardry or permissions needed this time. Games definitely won’t be an issue for Scorpio. Aside from that MS has: Crackdown 3, Phantom Dust, Scalebound, Sea of Thieves, Cuphead, State of Decay 2, etc., all coming and many still unannounced. My point is MS doesn’t need to rely on Halo, Forza and Gears they make them because fans of those games want them. People need to drop that silly rhetoric. the thing is exactly that! Scorpio won’t be needed to play ANY of all those games you mentioned. Yes! is great that you buy a new system and have that BC cataloge to chose from is you want to, but why exactly would the common Joe spend $500 on a console just to play the same games he has/had on its current console? Keep that damage control coming! I don’t even own a 360 anymore. I owned an Xbox 360 from launch day 05′ up until around 2 years ago. I haven’t even played 100 games out of those thousands I’m sure of it. My gamer score is not even 40k! Thousands of games and tons of variety on top of consistent 1080p at 60fps for all games, excluding games that will be running at 4k of course. Top that off with all the great Xb1 console exclusives from 3 years ago up until now with many new ones to come and many not yet mentioned, superior multiplats, superior online, Windows 10 compatibility and shared features and the Scorpio will be unmatched. Funny, I don’t see your response here, but anyways, you know what you wrote. What damage control? Ps4 has outsold x1 since day one. And the ps4 exclusives owned the x1 both in quantity and quality in 2016 and this year look the same. And you may want to pretend you’ll be playing those thousands of games when you didn’t play them when they were new and looked fresh instead of current games, but nobody else is going to. And you think all those games are going to be 1080/60? Man, that’s not even damage control, that’s delusion! Oh, you forgot to mention one single game that can only be played on Scorpio. What damage control? Ps4 has outsold x1 since day one. And the ps4 exclusives owned the x1 both in quantity and quality in 2016 and this year looks the same. So if there’s any damage that needs controlling its on MS part. The fact that you don’t see my previous response here was not my intentional doing so gloating about it as if you won something is stupid. The Xb1 S was outselling the PS4 since it’s launch ( for 4 months) up until November when it was outsold by the PS4 Pro by about 50,000 units. That’s a pretty narrow margin and quite frankly very unimpressive considering all the bs hype surrounding the PS4 Pro. If Sony managed to sell a total of 6 million + PS4 consoles in December then going by it’s previous months sales it’s quite conceivable that Xbox sales would be around the same mark. The way I see it going by Christmas sales, there wasn’t a real great desire for the PS4 Pro and January sales could very well go back to being in favor of the Xb1 S.
There are still many 360 games that I want to still play but haven’t and it doesn’t mean that I wont. Same goes for millions of other people like me and also the millions who haven’t even owned an Xbox 360 yet. That whole argument that backward compatible games are old so nobody will play them is just stupid nonsense. It’s obvious fanboy damage control and you all know it. We’re not talking about PS2 graphics here 360/PS3 games still hold up pretty good. The thing is, if the shoe was on the other foot your kind would be gloating about it to no end. As a matter of fact wasn’t it that way with the PS2 until Sony removed the emulator? I remember the fanboys gloating about it like it was the greatest thing ever. So hypocritical. Same goes for Indies, nobody in the Sony camp considered them as real games when the 360 had over 3000 of them but now that they happen to make up the majority of the PS4 library they’re so awesome! So what’s convinced you that the Scorpio can’t do every game in 1080p and at 60fps is it because the PS4 Pro can’t? If we look at both the Xb1 and PS4 we can see that the PS4 can play more games at 1080p than the Xb1 and we contribute that to the .51 difference in TerraFlops where the PS4 has the advantage. There’s almost 2 TerraFlops difference between Scorpio and the PS4 Pro, a much more significant difference. We also still don’t know what exact CPU Microsoft has decided to go with. There’s speculation that it could very well be the new Rysen architecture from AMD seeing that they’ve already announced it. It’s also possible that MS was under an NDA agreement and that’s why it hasn’t been mentioned so far and along with that they could be holding off for this years E3 to announce it along with the reveal. I don’t know a single game that can only be played on the Scorpio — nobody does yet and to be fair I don’t know of any PS4 Pro only games either, outside of VR. Scorpio will have VR too and obviously those games wont be able to run on the Xb1. Yeah, for all your “if” s and other speculations, ps4 has passed the 53 million units. Write me back when the x1 reaches 30…if that ever happens. But.. , but.. , the 4 months ? That was ONLY in the USA and wasn’t by that much either. We just don’t know because MS hide the numbers out of shame (that’s damage control). Is funny how you skipped the whole 2016 aaa exclusives topic where the ps4 owned the x1. But somehow you did write an essay about the million of users wanting to play old games. Oh, and the indies, what you really should say is that now that the ps4 has more and better ones than the x1. The VR answer is a good one, those games won’t come to the x1, but for the rest you forget Phil already said it won’t be any Scorpio exclusives, no one gets left behind remember? So there won’t be any killer app. “Sales for their console were up compared to Sony”???? What? when? The x1 never outscored the PS4 globally. You do know they sell this consoles in the rest of the world do you? And even if we stick to just NPD’s numbers, outselling the ps4 for just 4 months out of 12, that doesn’t mean they sold better for the year. Now, to your question, it will be very hard for them to sell big numbers without those (even FH3 and GoW4 didn’t sell that well last year). And they will sell the Scorpio to MS fans no doubt, but without exclusives and not even a AAA exclusive like halo to bundle it with, I don’t see how the average person would want to spend that much on a console that has the exact same games that the X1. Yes. Those franchises do not drive the XBOX console business….XBOX Live does. 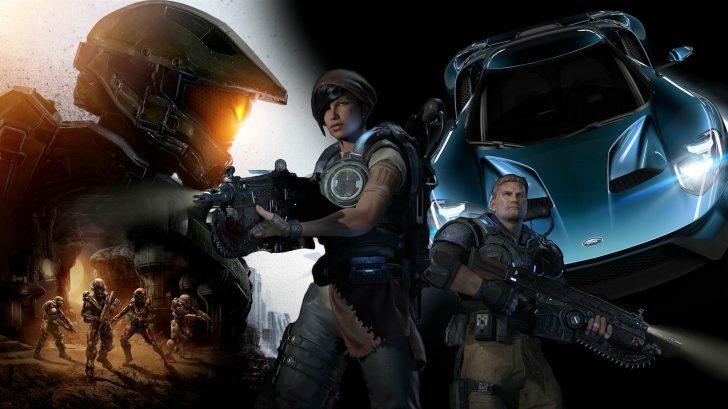 Multiplayer gaming and the Live community is the lifeblood of XBOX, and the vast majority of people who are XBOX fans stick with it because their friends do. Call of Duty, Battlefield, Madden, Rainbow 6 are all huge franchises for XBOX because of Live. The $$ the make off software sales doesn’t come close to what they make off XBL subs and purchases made through the XB Store. This is hilariously bad. And now ads between comments? No more visiting from my phone. Ad block enabled pc only.